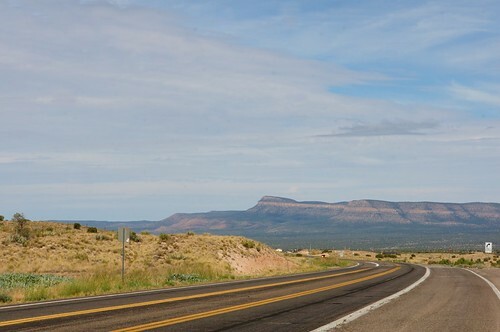 Today would be our last day westbound, and we would turn around in Needles and return east, taking 66 most of the way (when possible) and in particular, some areas of 66 that we missed on the way out. Due to time constraints, in a few areas where we did take 66 west, we might skip them east….depends on how our timing goes. 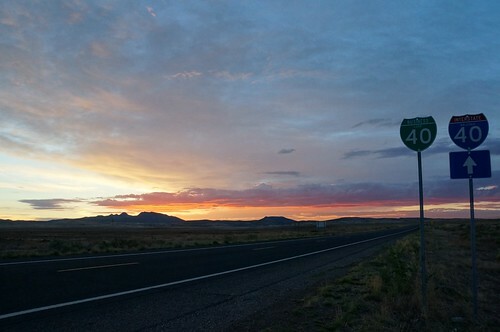 I woke up before sunrise, which was odd considering how little sleep I’d had on this trip. 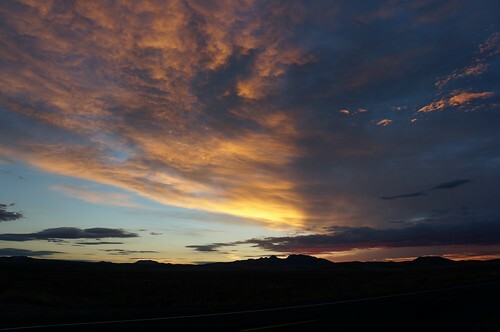 But it was fortunate, because I was treated to a very beautiful and peaceful sunrise in Seligman. 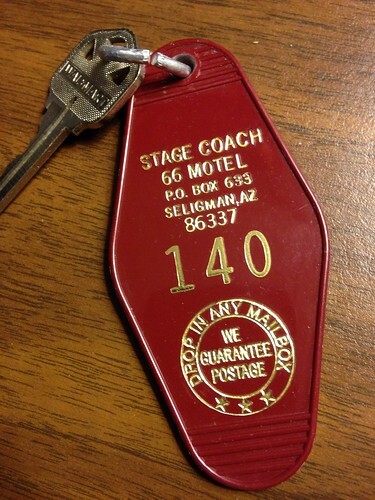 Love the old motel keychains! Once my grandson was up, fairly early – we began the ritual of getting him ready and packing up. 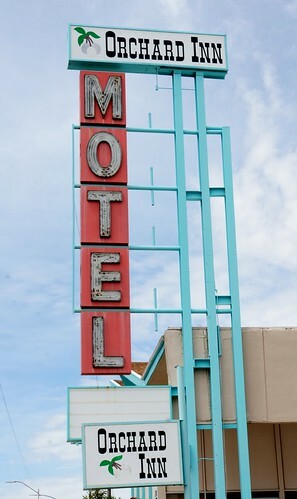 He was very helpful today, since the motel was on one level. He was able to carry his own belongings out to the car, which made the process easier! 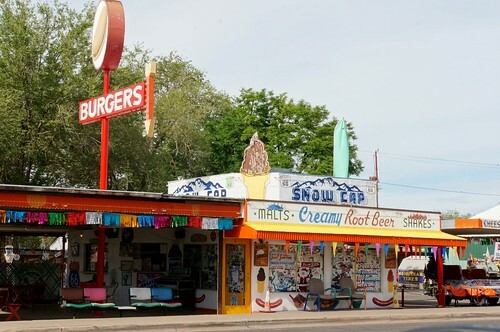 Sadly, we were not in Seligman during anytime that the Snow Cap was open, but here is a photo this morning. 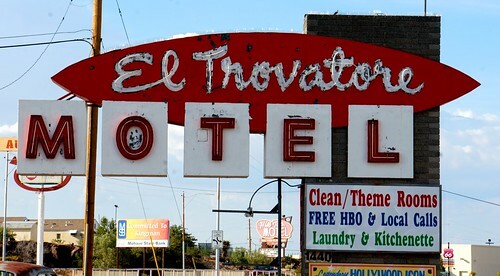 We had been here before when Juan Delgadillo was alive; my first visit was on my trip in August 2000 with my daughter and the next time was on my honeymoon in June 2002. As always, I required coffee. I was very happy with the VERY good coffee (and half and half – yeah!) 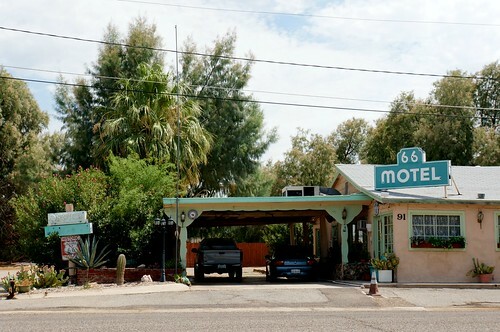 at Historic Seligman Sundries. 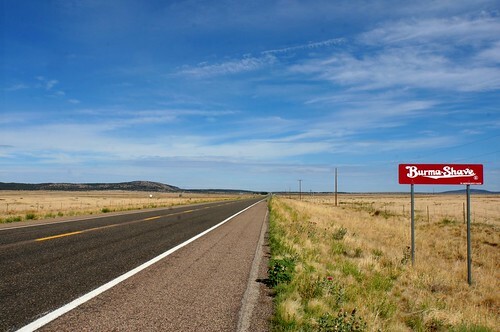 There are several sets of Burma Shave signs around Seligman. Pat is not into them, but I am, and I was driving, so I subjected him to a complete reading of each…and…every…set…of…signs. 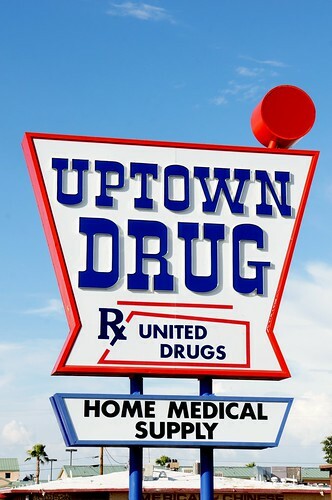 Pat asked me to turn around and stop in this area. Off to the right, there appears to be a small dirt track of some sort. 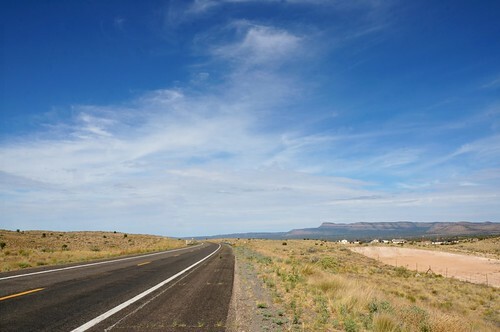 It has fairly high banked curves and Pat’s thought was that it might have provided some inspiration for the dirt track in Cars. 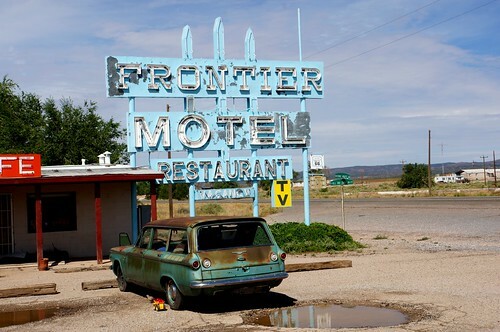 In Truxton, we passed by the Frontier Motel, which is currently undergoing restoration of the motel and cafe. 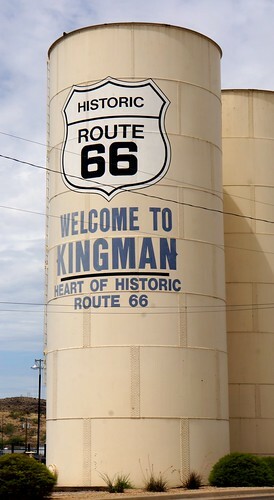 Entering Kingman, we are nearing the end of our westward journey. 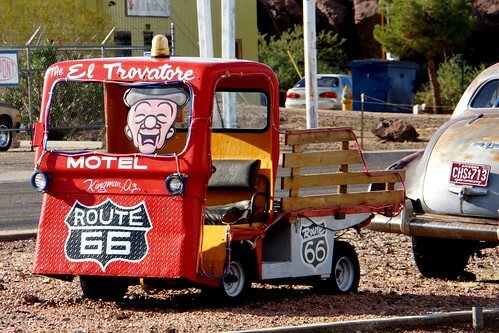 Here is the Route 66 Motel. 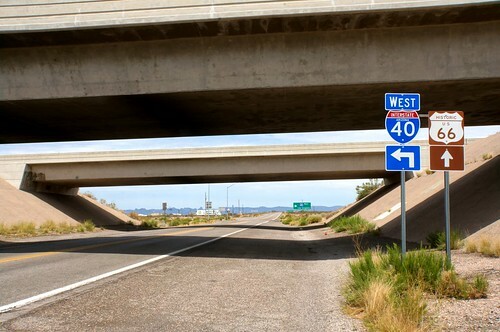 Here is the turn under I-40 outside of Kingman to take Route 66 (Oatman Road), the older alignment of 66 that goes through the mountains and through the town of Oatman, home to the burros! 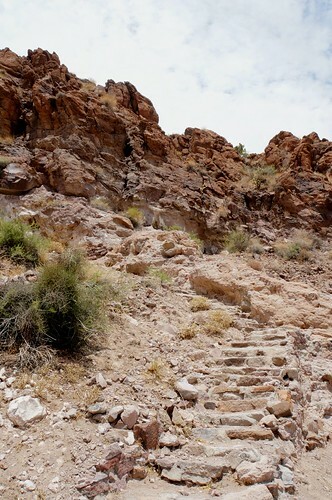 What a climb…we did it!! 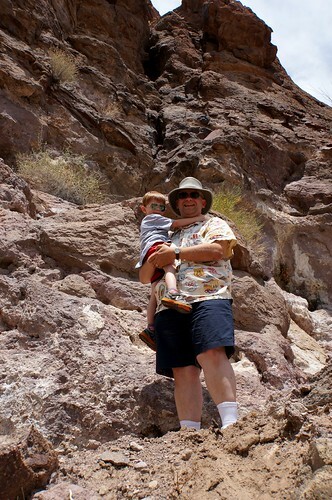 But looking back down, the little man then got scared and wanted to come back down. 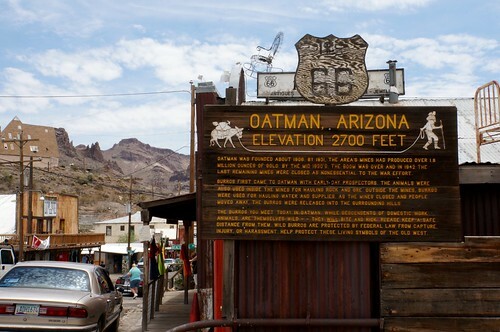 Oatman’s most famous inhabitants are currently the burros, which come down from the mountains every day during business hours (like clockwork) to visit the tourists, who will gladly feed them. We prepared our grandson for the excitement of the burros by watching YouTube videos. 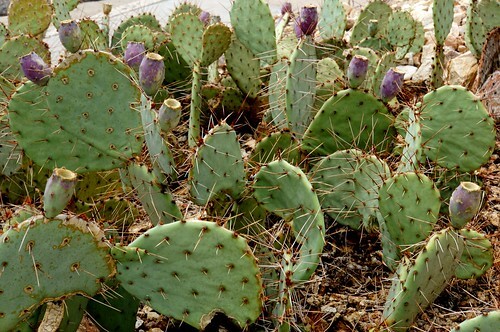 We bought some burro food from a shop, but all the videos in the world weren’t going to help him adjust to a frightening sense of overwhelm at being surrounded by these giant creatures (to his little 3 year old self, they were). 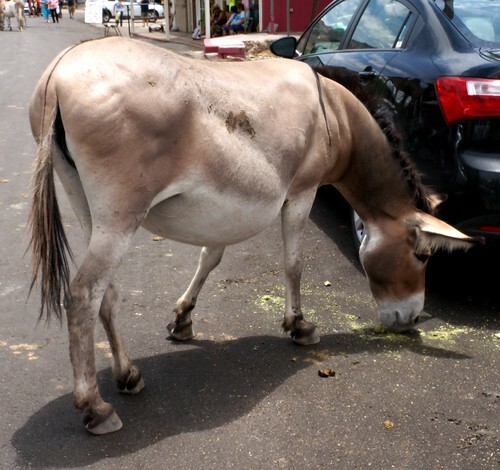 I also felt a bit panicky at having them surround him, so I quickly grabbed the burro food and tossed it away and pulled our grandson out of the circle of burros he’d been surrounded. They gave us slight chase, but when they realized we had no food, they moved on to other tourists who did, and who helped lure them away. We bought him a stuffed animal burro, which he enjoys and happily isn’t too emotionally scarred from the experience. 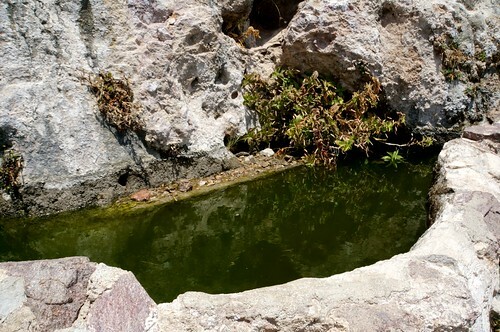 He did say afterward, that he doesn’t want to see the real burros again, so I think there is a little scarring. Hopefully, he’ll change his mind when he gets older. 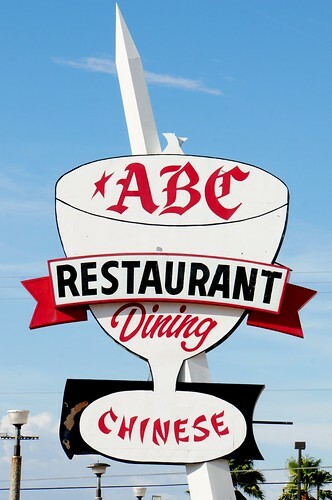 We had some ice cream to cool down before we left town. 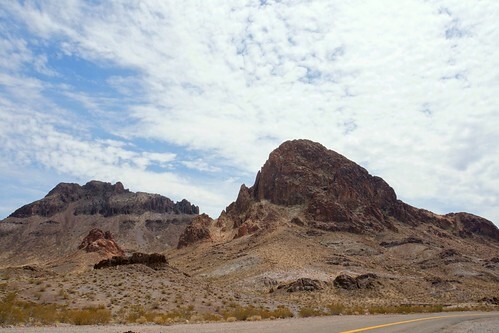 West of Oatman, heading toward Topock. 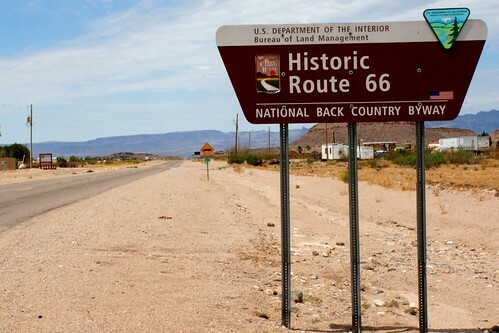 We had read on one of the Route 66 Facebook pages that the road near Topock was closed due to rains earlier in the week. 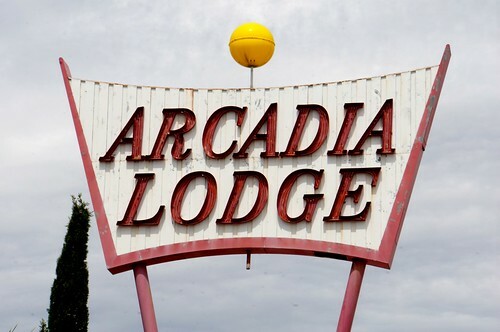 I was unable to check on that or ask anyone if that was still the case, because we had very little Internet signal. 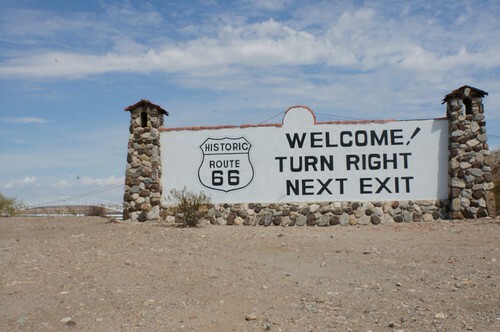 Sure enough, in Topock, the road was closed so we went to Needles on Route 1, and then 95 and crossing down into Needles, California. 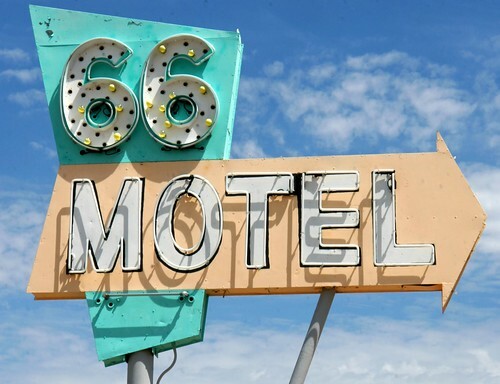 We saw the 66 Motel, with its recently (2012) restored sign, with fundraising led by Ed Klein of Route 66 World. 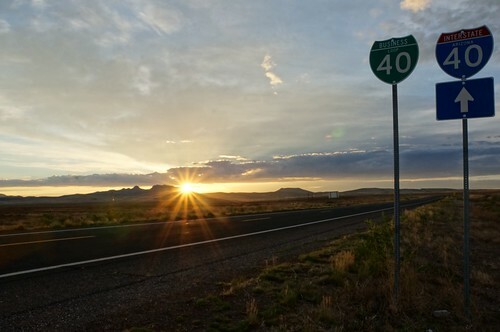 After Needles, we proceeded to head east on I-40 toward the Park Moabi Road exit (153), where we would be taking more photos of locations used in the opening credits of Easy Rider between here and Exit 1 on the Arizona side. 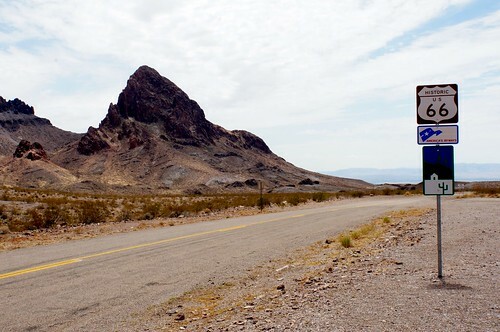 Click here for my post of the Easy Rider Filming Locations, with photos and description of this area, as well as screen captures from the movie. 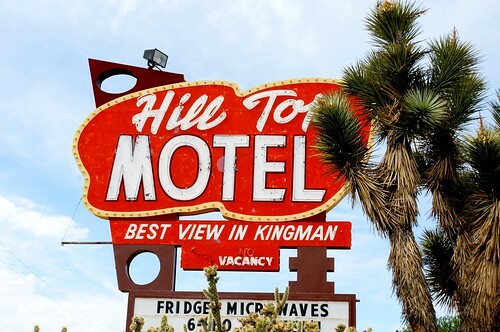 After finishing with all of the movie locations around the Arizona – California border, we headed back east to Kingman on the Interstate, which was a later alignment of Route 66, starting in 1953, bypassing the Oatman Road alignment. It’s a longer way around (really, it feels long!) 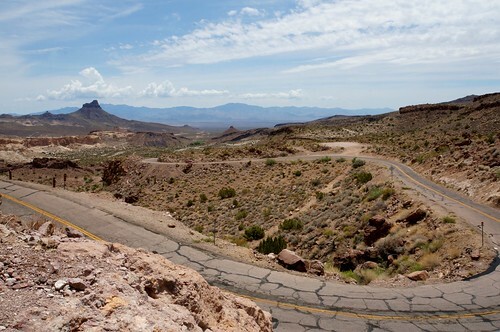 and far less interesting and fun than Oatman Road. 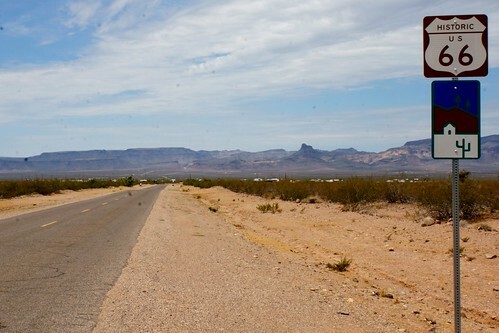 But we’d already taken Oatman Road on the way out, so we took this way back until we got to Kingman, where we exited back onto Route 66. 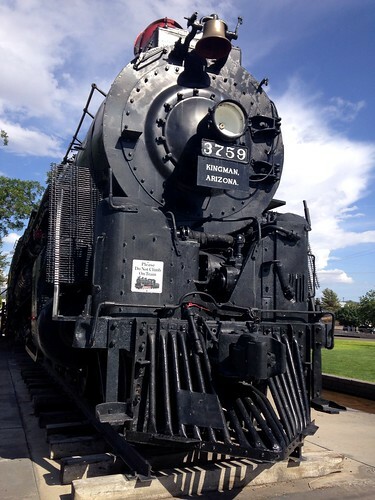 By this time, the little man needed a playground break and we wanted to eat, so we killed two birds with one stone by stopping in Kingman by Locomotive Park, home to this 1927 steam locomotive. 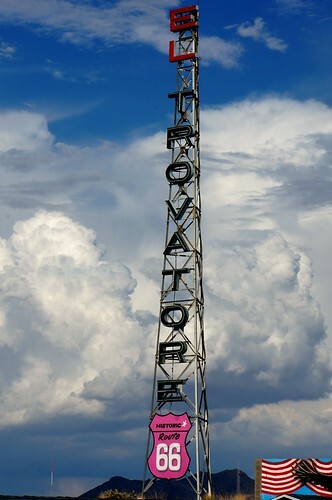 Click the link for more info on the steam train. Jameson had fun running around and letting off some steam (pun intended!). 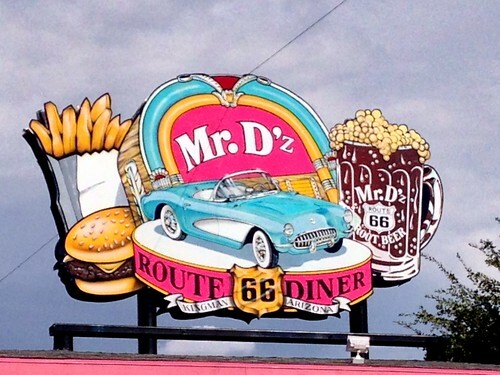 Once we felt we could take a break from the train, we headed next door to Mr. D’z Route 66 Diner to eat, followed by a little more play time at the train. 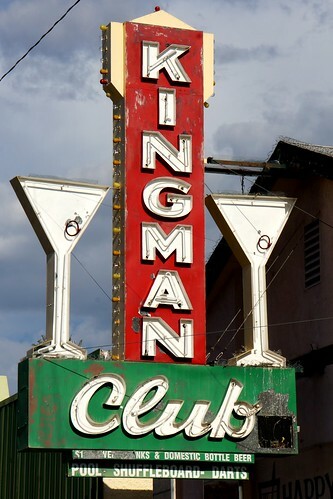 Moving on, this sign for the Kingman Club is on Beale Street. 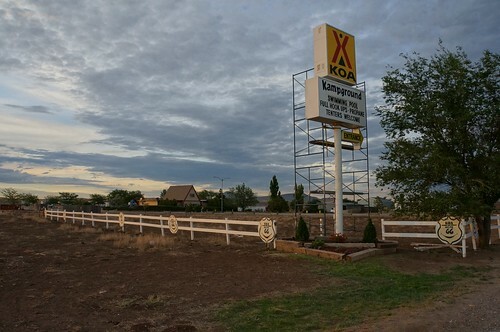 We continued east on 66 through Kingman, and took a few photos we didn’t get on the way west. 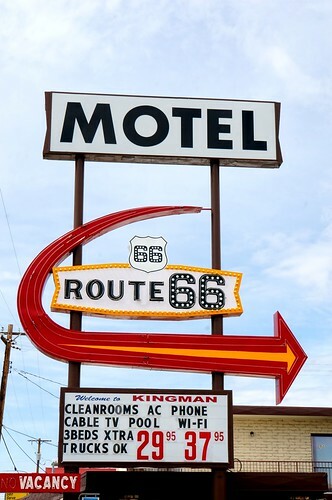 We continued to take 66 east from Kingman. 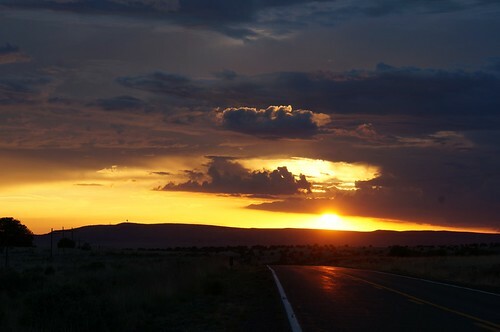 East of Seligman, I noticed the sunset in the rear view mirror and thought it was beautiful enough to stop for a photo! 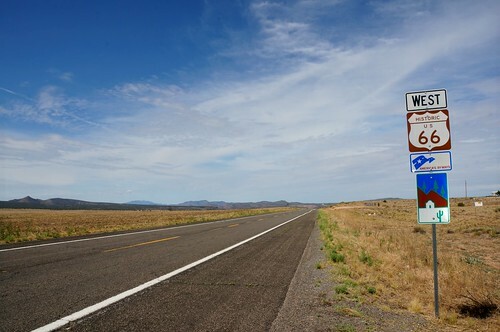 Once 66 leads into I-40 near Ash Fork, we took the Interstate east to Williams, where we took 66. Since it was getting late, we had already decided to stay in Williams for the night.